I’ve always been a sucker for unique antiques. Anything unusual, in purpose or design, catches my eye. I like to imagine its history, its story, then envision ways I can repurpose it. 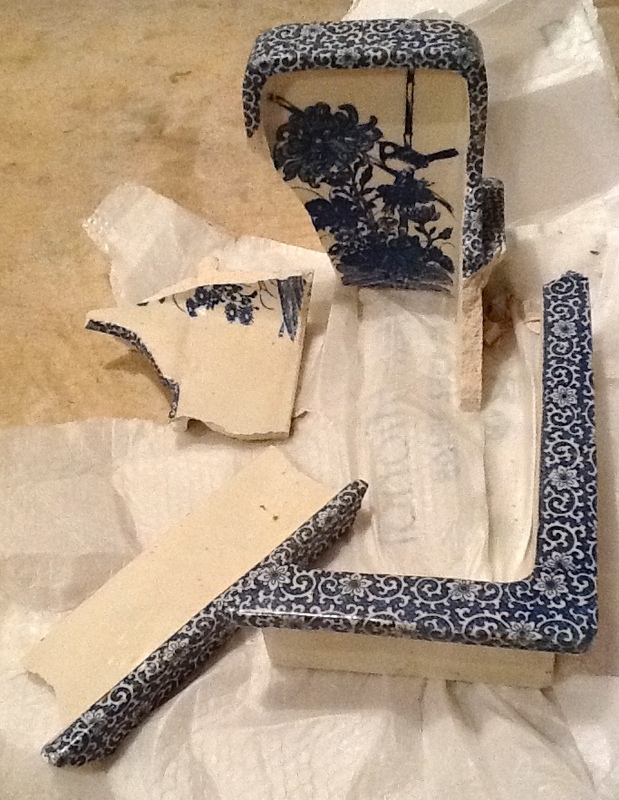 So when I saw a hand-painted blue and white porcelain benki (squatty toilet) at an antique vendor’s stall in Japan, I just had to have it, even though I wasn’t yet sure whether it was going to become a planter or if my cat was going to have the world’s fanciest litter box. When we got ready to move from Japan, I had the benki, encased in a plastic bag (it was once a toilet after all), stored in the spare room. When our belongings arrived at our next post in England, I expected to find the benki among the other miscellaneous junk I was unpacking from boxes that originated in the spare room. Imagine my surprise when I pulled it out of a box of dishes in the kitchen! I was incensed. It was a Japanese toilet. The packers were Japanese. They pulled it out of the plastic bag before packing it, so they had to know what it was. People who change into completely different slippers when entering the bathroom so as not to contaminate their house slippers surely would not pack a toilet in the same box as dishes. What were they thinking? Did they think I didn’t know what it was, so I wouldn’t care that a toilet rode 5900 miles next to my dinner plates, separated only by a few thin layers of packing paper? Apparently, even if it wasn’t hygienic, they knew what they were doing, because the benki arrived in England intact. The packers in England, despite never having seen a benki, instinctively knew not pack a toilet with kitchen items. They wrapped it in bubble wrap all by itself. It went into a crate with boxes and furniture and a bike, and had no chance of contaminating my dinner plates on its 3600 mile journey to the US. Apparently, even if it was hygienic, they did not know what they were doing, because the benki arrived in Virginia in pieces. I am very sad. Not just because I now have neither a planter nor the world’s fanciest litter box. I’m sad because I equate buying antiques to rescuing unwanted pets from an animal shelter. When I choose a piece and make it mine, I become its guardian, its voice, its guarantee of continued existence. I once held a very unique piece of Japanese porcelain in my hands, prepared to show off its beauty and tell its story to an audience on a whole new continent, and I failed to protect it. I feel as guilty as I would if a cat I adopted ran out into the street and got hit by a car. Posted by dreaminofobx on September 18, 2013 in True Life, What's She On About? The color and pattern was so beautiful. Blasted packers! Aw-I am so sorry that got broken! I remember when you bought it and thought it was very unique.